On Tuesday, April 3, Wisconsin voters went to the polls to vote in municipal races, school board elections, and local referendums. 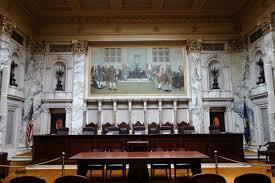 However, the marquee race was the State Supreme Court general election, the only statewide race on the ballot. Rebecca Dallet, the liberal candidate and Milwaukee County judge, defeated the conservative Sauk County judge Michael Screnock by a large 12-point margin. “I think my message resonated with Wisconsinites. People are tired of special interests ruling and wanted to speak up,” Dallet told the media after her win. For Wisconsin Democrats, the results signified a major victory and a sign of things to come in the November general election. Tuesday’s victory for Democrats comes less than 2 months after Democratic Senator Patty Schachtner handily defeated two-term Republican State Representative Adam Jarchow by over 10 points in a special election in the 10th Senate District. Wisconsin Democrats are calling the recent victories a “Blue Wave”. Multiple media outlets broke down Tuesday’s voting statistics at the county level and found Dallet won 24 counties that Democrat Hillary Clinton lost in the 2016 presidential election, which could signify a change in voting behavior as well as voter-rejection of current Republican control. It is worth noting Tuesday’s voter turnout was 22 percent, which is high for a spring election but well below a presidential or gubernatorial fall election. Tuesday’s ballot also held a Republican-led statewide referendum to amend the state constitution and discontinue the office of the state treasurer. Republican advocates argued the office no longer serves a purpose since its duties have been delegated to other offices. The current state treasurer, Matt Adamczyk, actually ran for office in 2014 on the basis of eliminating the position. Despite their arguments, the referendum failed on a 23-point margin, perhaps signifying a further rejection of state Republicans by voters.